Vizio's new monstrous (in the best way) new sound bar packs some smart new features including center channel vocal boost and different levels of surround virtualization, but the best thing about it? It's super cheap. 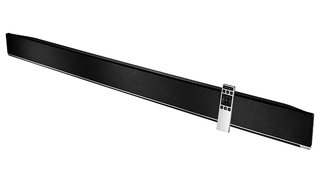 For just $300 you get a 54-inch sound bar—the right size for TVs that are 55 inches or larger—that pumps out 103dB of noise. It offers up three channels of sound, an integrated deep bass module to help ill the room, and surround viewers. Elsewhere, there's audio enhancement technology to keep vocals clear and music crisp, and intelligent volume-leveling that tries to minimize the effects of different levels in boradcast content. It's also Bluetooth-equipped, which means you can stream music from your smartphone as well as hooking it up to your TV. All told, that's a hell of a lot of spec for $300.